We're trying something new here at ABS - weekly color palettes! I hope you're as excited for that as I am. We could all use some colorful, beady goodness, right? Right. 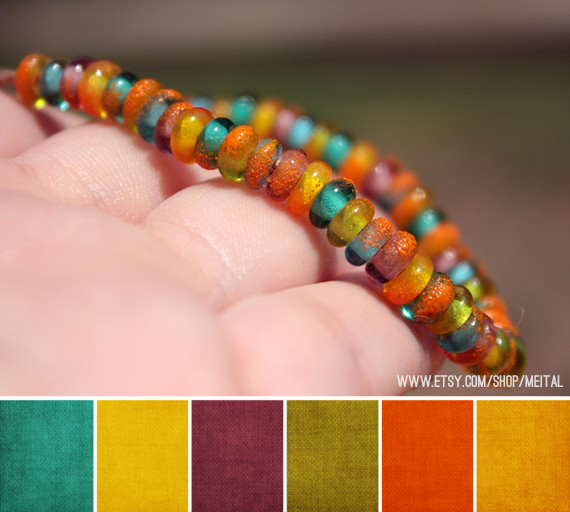 This week, I just had to share these colorful spacer beads from Meital Plotnik. Aren't they fun? I especially love the added touch of orange on each bead - so lovely and festive. Plus, the smaller size is a great way to dive into lampwork beads, if you've never tried them before. To see more from Meital, stop by her Etsy shop. I think this is a great feature. Thank you! I love your palettes. When the monthly challenge art comes out, sometimes I can't decide what I think until I see your palette! Love this addition! I am with Ann. A lot of times it is your palettes that inspire me more then the paintings. Thanks so much, ladies!! I appreciate that!